Celluloid Junkie is proud to have partnered with Vista Cinema for the Cinema of the Month series. Vista is the world’s leading cinema management software solutions company. We won’t just be featuring cinemas whose operators use Vista, but we will surely mention when that is the case. CJ would like to thank everyone at Vista for partnering with CJ to showcase some of the most interesting, innovative and inspiring cinemas from around the world. 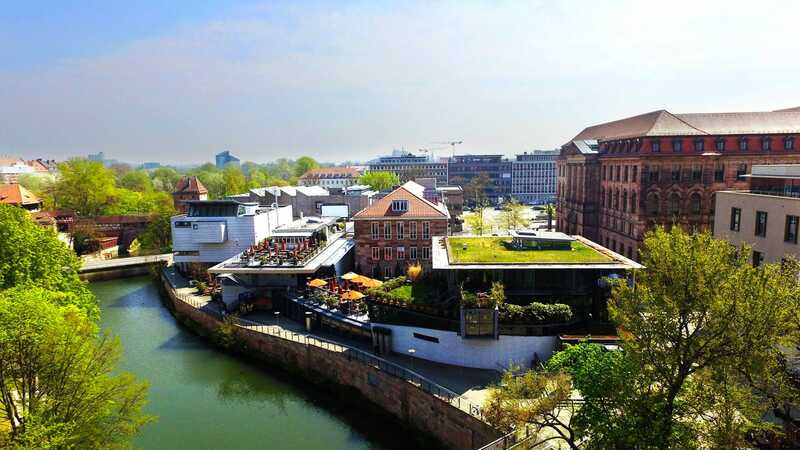 How do you fit Germany’s biggest multiplex with 22 screens onto a small surface area right in the historic centre of a medieval city? The answer is you dig down; deep, deep down. 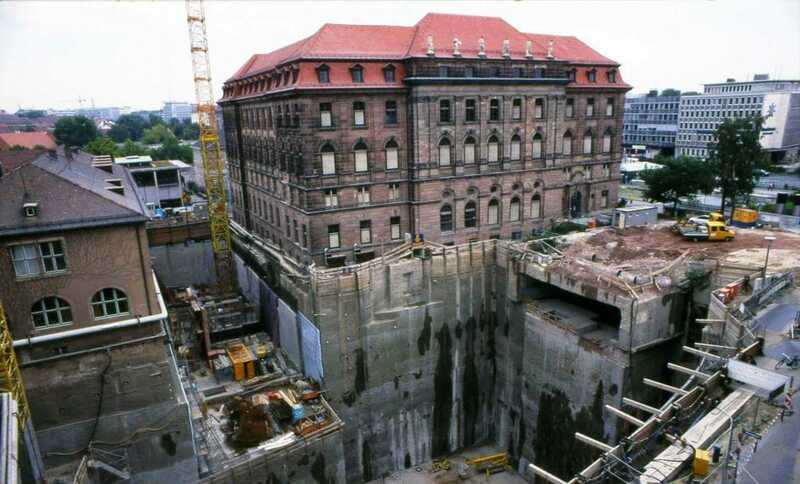 Nuremberg’s Cinecittà isn’t the world’s only ‘ice berg’ cinema, where only a small proportion can be seen above ground, but it is definitely the most impressive. 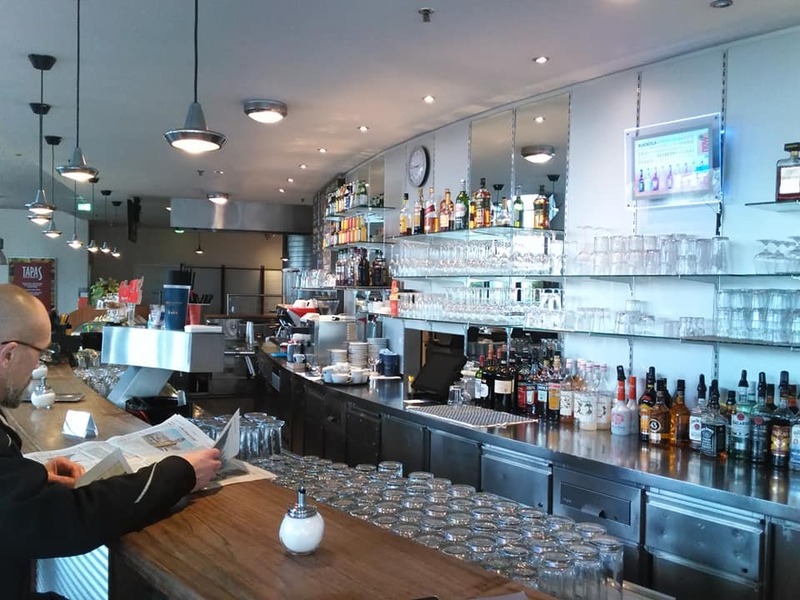 Far more than just a large multiplex, theatre, cafe, bar and restaurant, it is an experience of entering an Aladdin’s cave of what is possible with cinema. 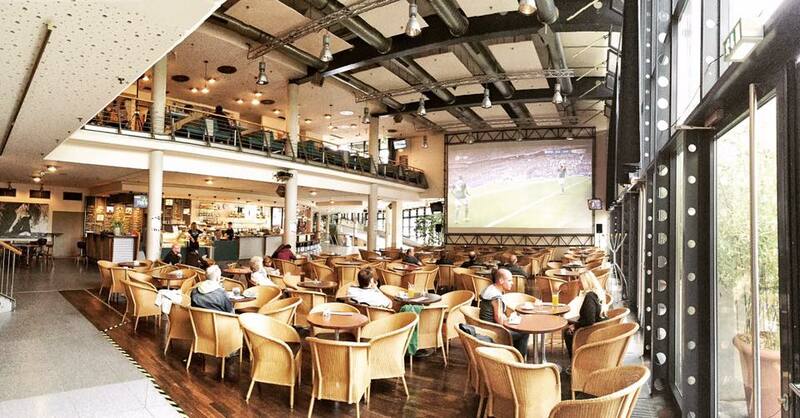 This is not just Germany’s most successful cinema, but it might also be the country’s best multiplex. The cinema takes its name from the famed Italian film studio where “La Dolce Vita” and “The English Patient” were filmed and which made Rome a ‘Hollywood on the Tiber‘ during the 1950s and 60s when films such as “Ben Hur” and “Roman Holiday” were shot there. This could be presumptuous for any other cinema to call itself, but Cinecitta’ Nuremberg gets away with it. 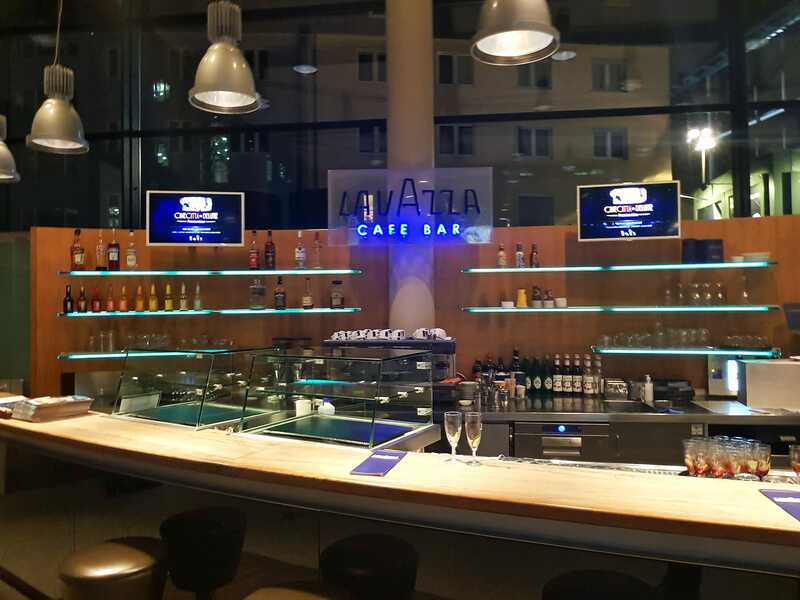 It was opened in October 1995 by cinema impresario Wolfram Weber, who’s family business already operated and owned nearby cinemas such as Atrium, Casablanca and Metropolis. The cinema was an instant success and by 1997 it was enlarged. Then in 1998 it was decided to further include an IMAX screen. When the expanded cinema opened in 2001 it was called ‘Megaplex Kino’. Today it includes two above-ground entrances with 14 ticket counters, 17 regular screens, one premium large format (PLF) screen (more on this later), a multi-function theatre, a motion-ride cinema, two DVD screening rooms, four restaurants, two shops with DVD rental, a coat check facility, a virtual reality (VR) experience room and eleven bars and concession counters. Beyond the multiplex, Cinecittà also operates an open air cinema in the summer and is a beehive of pop-up activities throughout the year. 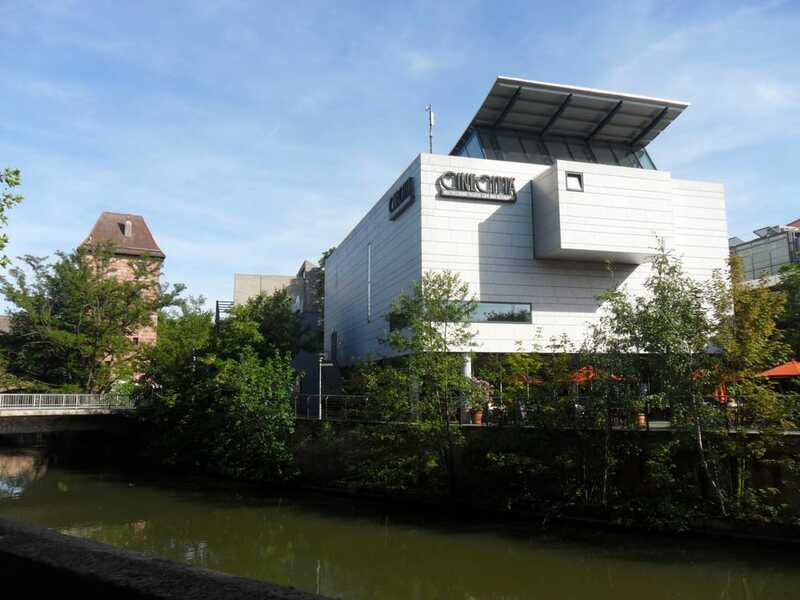 It is no surprise that the finished cinema cost EUR €75 million euro (USD $92 million) to complete. 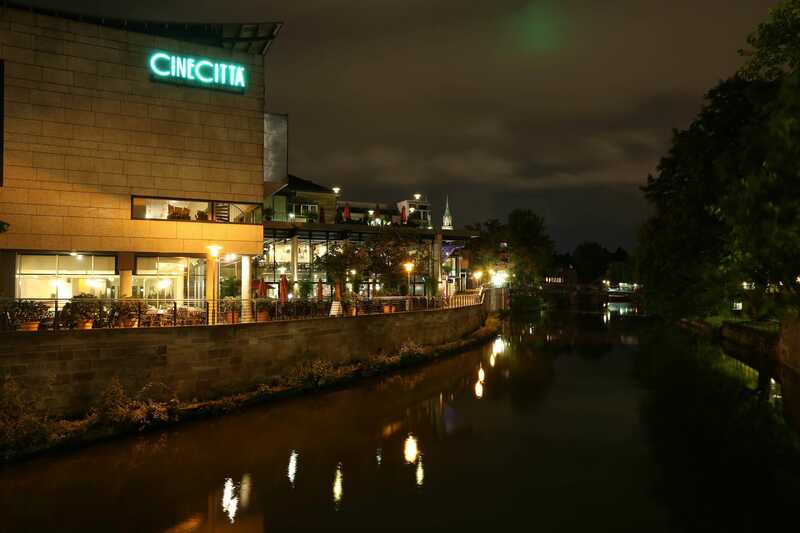 Approaching Cinecittà should ideally be done by boat along the Pegnitz River that flows through Nuremberg. 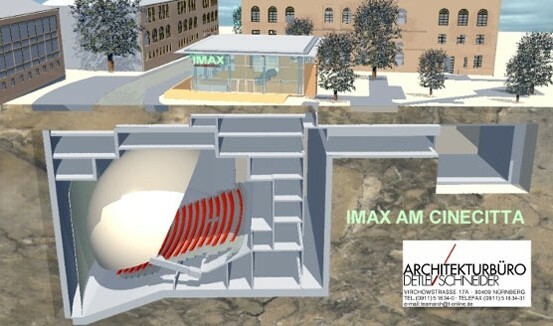 This is where you will have the clearest view of the cinema, which is exposed like an architectural cross-section view from the river side. 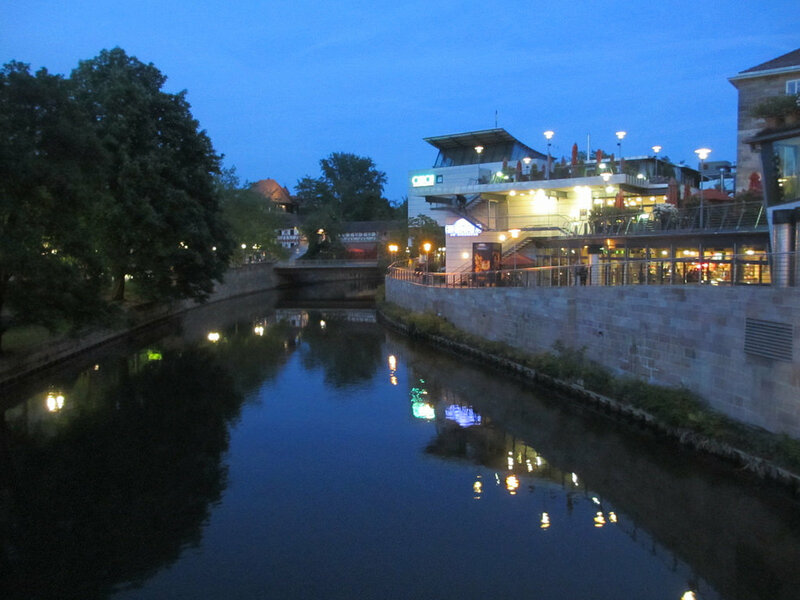 Walking towards it does not begin to do the cinema justice, because it is cleverly fitted in between and under existing historical architecture on the east edge of Nuremberg’s Old Town. 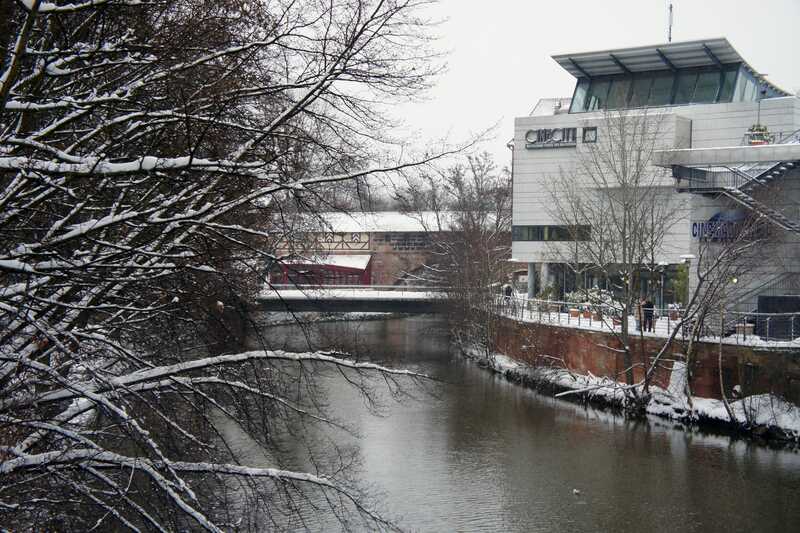 As such, it is hemmed in by the Middle Aged city wall, the City Library and the Gewerbemuseum building, all located along the city’s Cultural Mile. As if to dispel the notion that any Stormtroopers might suddenly come marching by, on the second floor I found a painting class (!) in progress in the communal area. 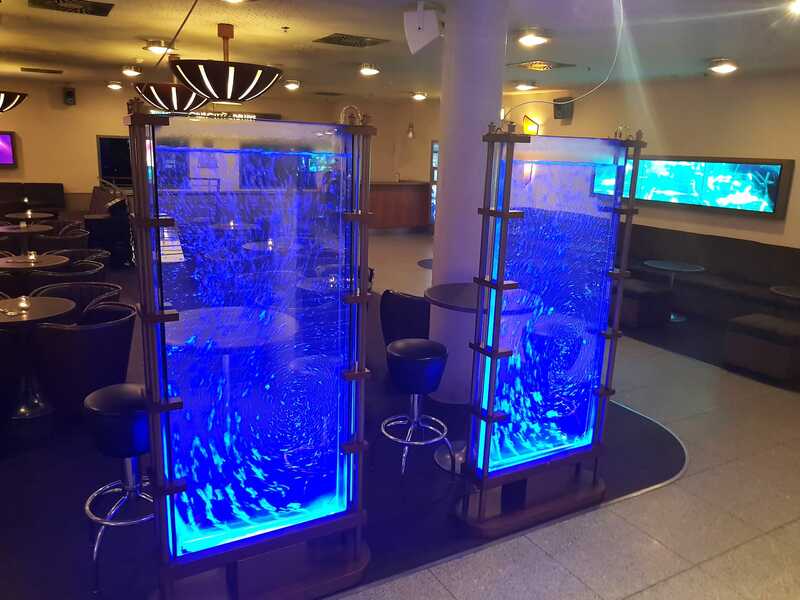 It is a good thing that the water filled partitions with bubbles and blue light were there to prevent me from taking a step back into the escalator shaft out of sheer surprise. Apparently it also hosts tango lessons, speed dating and film quizzes on other nights. 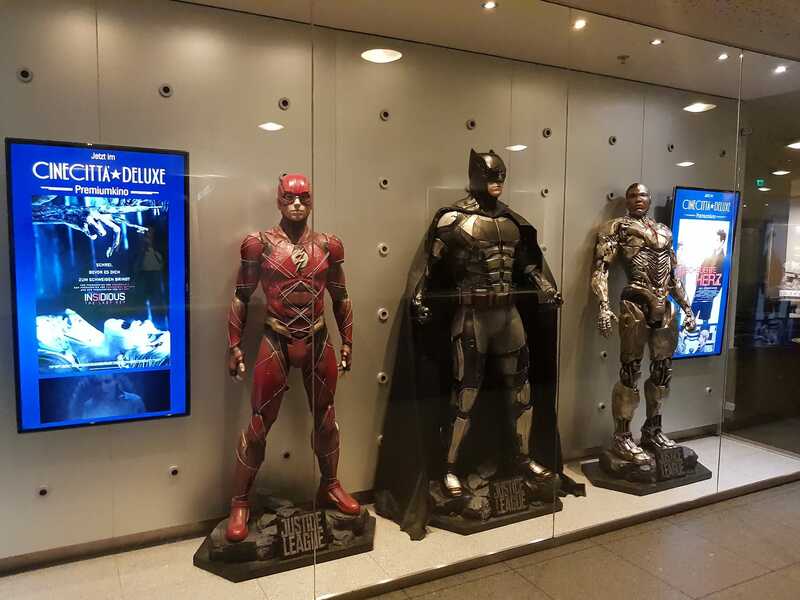 There are long corridors connecting the two sides of the megaplex, filled with posters, LED screens, paintings by local artists, DC Justice League costume displays, concession counters, spotlights, as well as plenty of sofas and loungers. In a dystopian dream, this would be like the kind of nuclear bunker I would want to sit out World War III in. 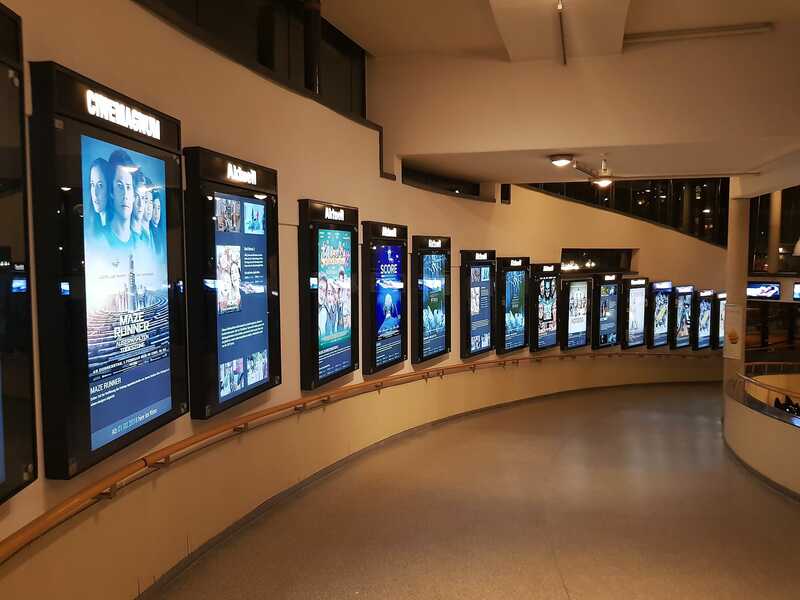 Overall the foyer area takes up over 5,000 square meters Looking down the escalator shaft, in addition to posters hanging down its length of the, there are pictures on the walls of whales and sharks, which together with the blue light give it a submarine feel (think Captain Nemo), perhaps to offset the bunker reality of the location. 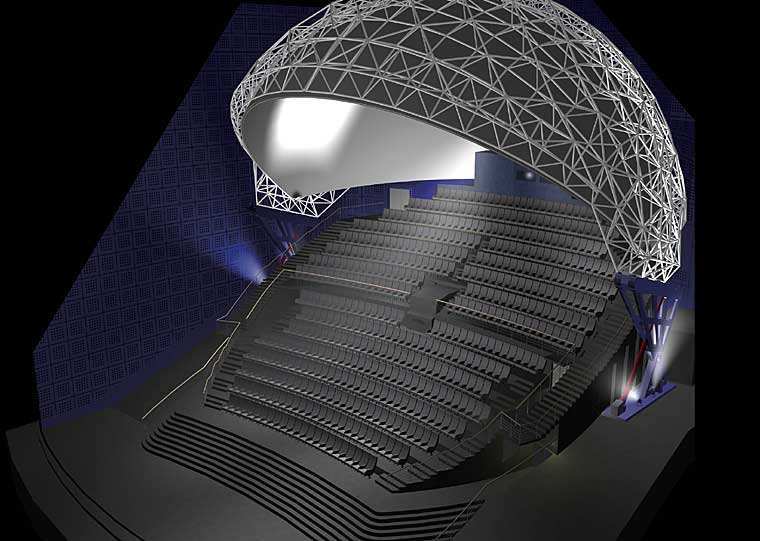 Cinecittà has 17 regular cinema screens, all designed around the same concept of stadium seating and a concave screen, as well as motorised screen masking. Each auditorium has between 103 and 547 seats, with the seven largest being THX certified. 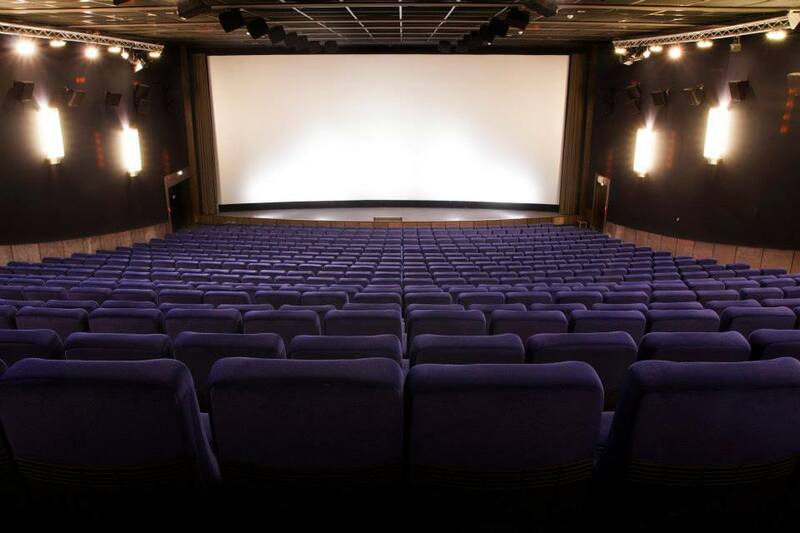 Ten of the screens offer Dolby Atmos and indeed,Cinecittà was the first cinema in Germany to offer the format. The other auditoriums have 7.1 Dirac Live. The premium screens offer Sony 4K Finity and Sony Laser Dual 4K in Kino 1. 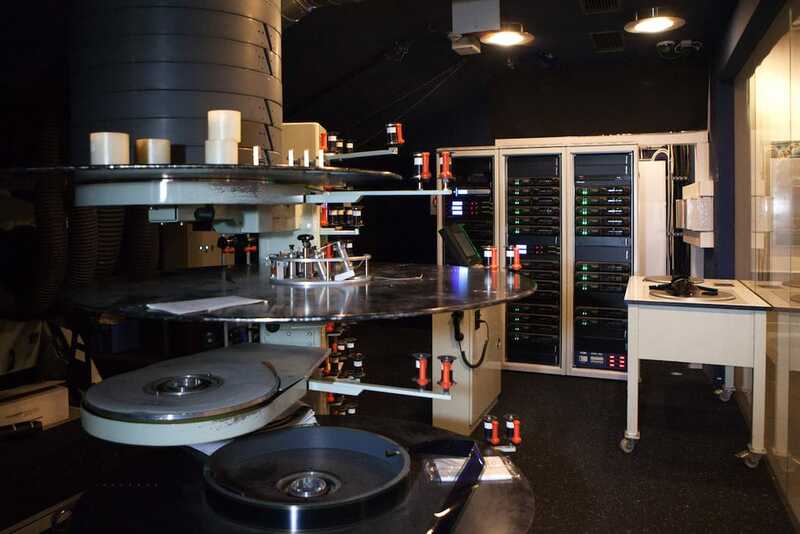 Two of the smaller auditoriums (Studio Kino) are used for high quality presentations of DVDs and Blu-rays. There are four Deluxe screens that offer two meter-wide rows of electric recliner seats, with push-button service. All the seating comes from French manufacturer Quinette and some seats have an arm rest that can be raised for couples. If you want exact specifications of each auditorium there is a section on the Cinecittà website that provides this in extreme detail. Or for a detailed technical overview check out the YouTube video below (in German) from Grobi.tv. Perhaps it shouldn’t come as a surprise that this cinema is highly engineered, beautifully turned out and run with attention to the smallest of details, given that this is the same state (Bavaria) that produces the BMWs. 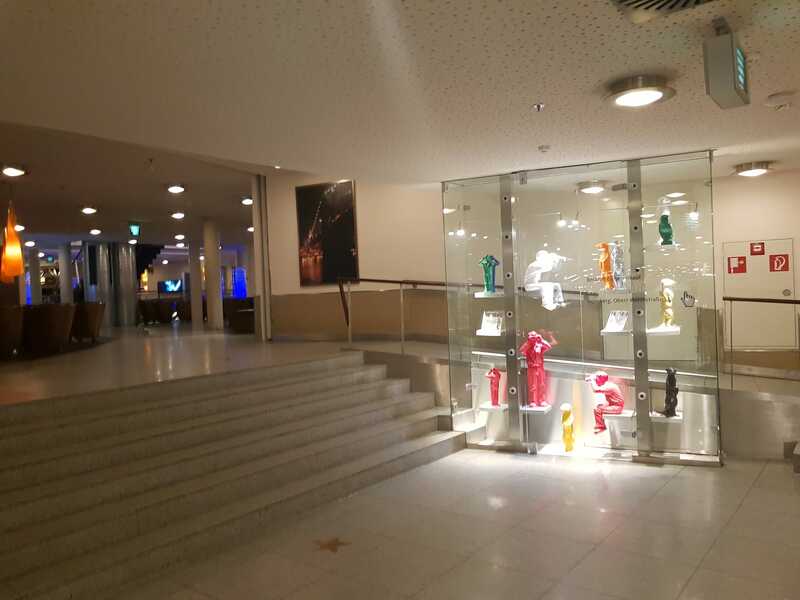 For those with vertigo – or simply lacking the time to spend on escalator after escalator – there is also a lift that will handily take you seven stories under ground to the entrance of the Cinemagnum. This auditorium opened as an Imax screen in 2001 and still looks the part. 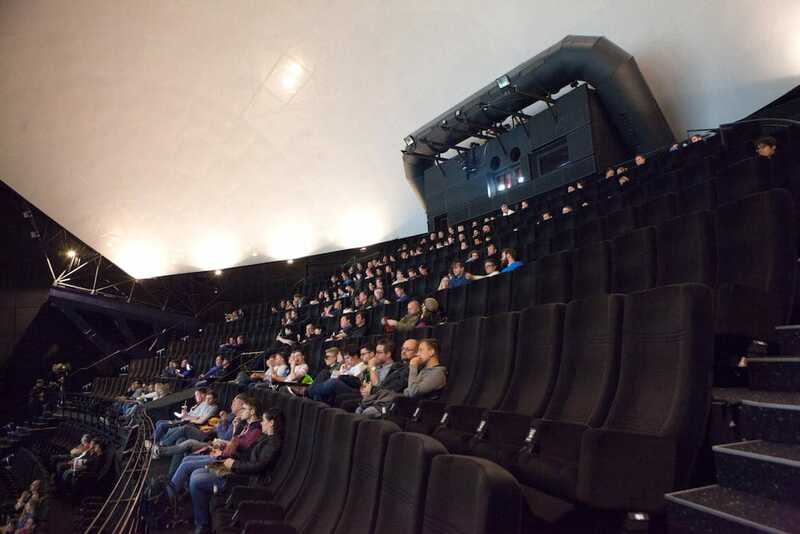 At 610 square meters it is the largest 3D screen in Europe measuring 32 meters across. 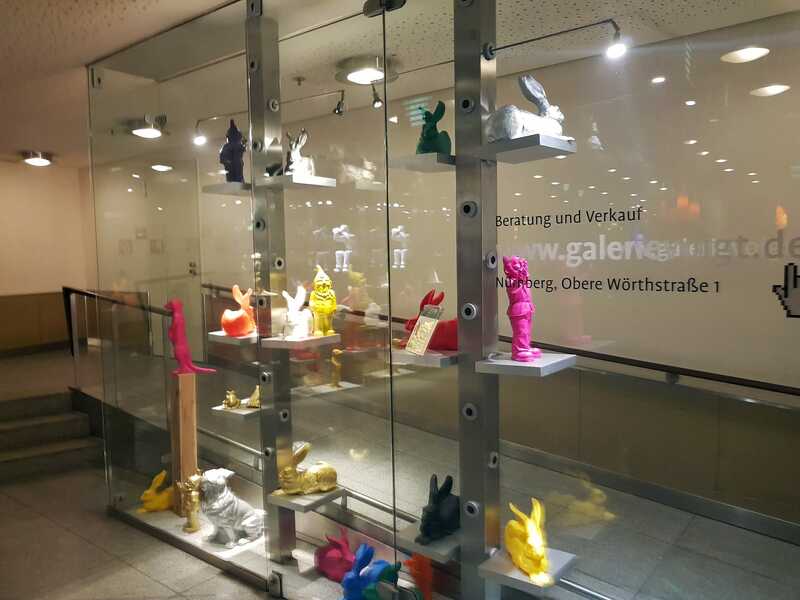 Perhaps most impressive is that it is located 35 meters under ground – and it is taller than the Gewerbemuseum next door. With 538 seats there is plenty of room. 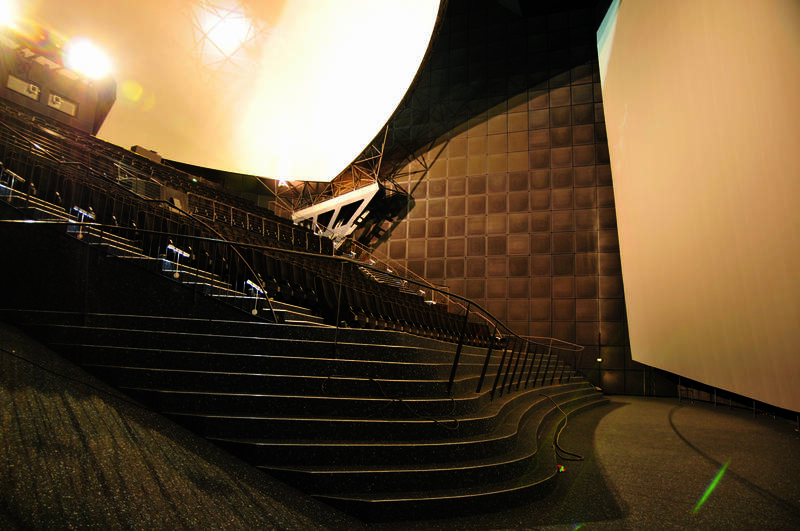 It even has an 840 square meter dome screen that can be tilted into place with hydraulics, though this is no longer used. 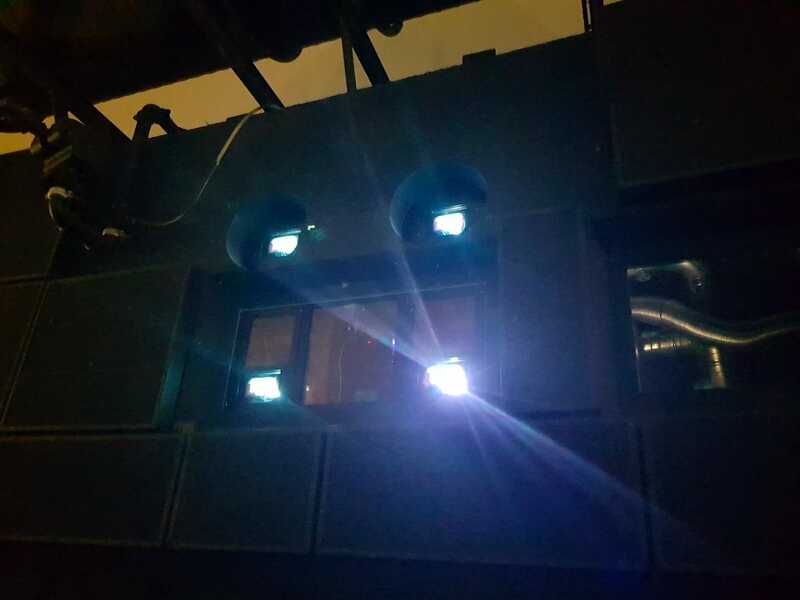 The projection system utilises a Quad Sony 4K solution that is a wonder to behold. The 3D images were bright with strong colours and no eye strain. The Dolby Atmos works so well that the silent sequences in “Star Wars: the Last Jedi” take your breath away with just the absence of any sound. It was enough for me to sit and enjoy the film a second time – even dubbed into German. Perhaps not surprising given that the light output is a staggering 60,000 lumens. 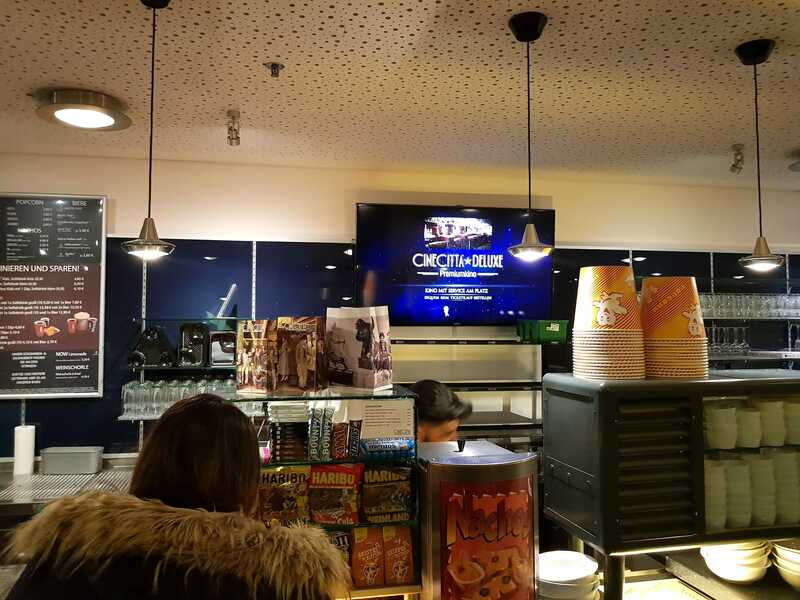 The multiplex does offer OV, or screenings in the original language, which are starting to gain traction, particularly amongst younger viewers who are used to English-original and subtitles from YouTube and Netflix. Overall the cinema offers a very rich and varied programme of films, not to mention special screenings, sneak previews, event cinema, film festivals and cultural events. 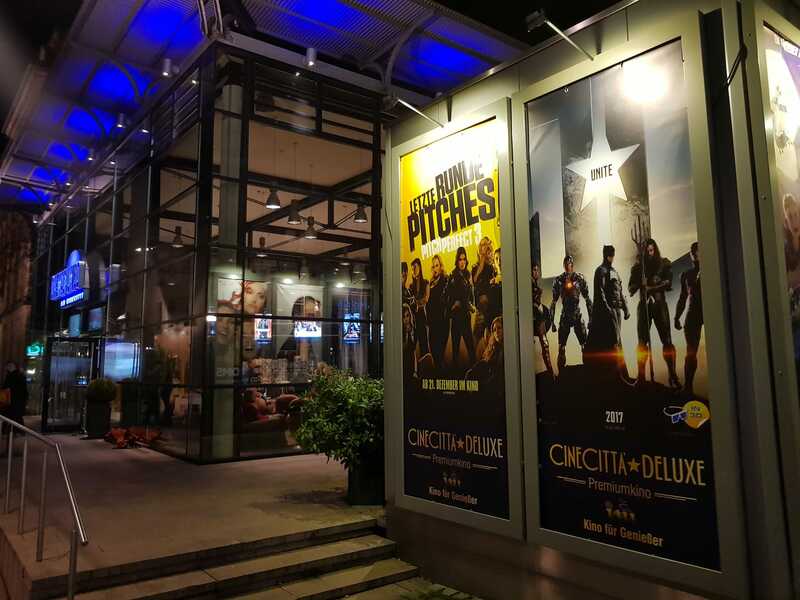 Sadly I was not at Cinecittà long enough to sample one of the four restaurants (“Indochine“, “Tapas“, “Trattoria“ and “American Diner“) but the popcorn and Coke was generous in portion without being too expensive. 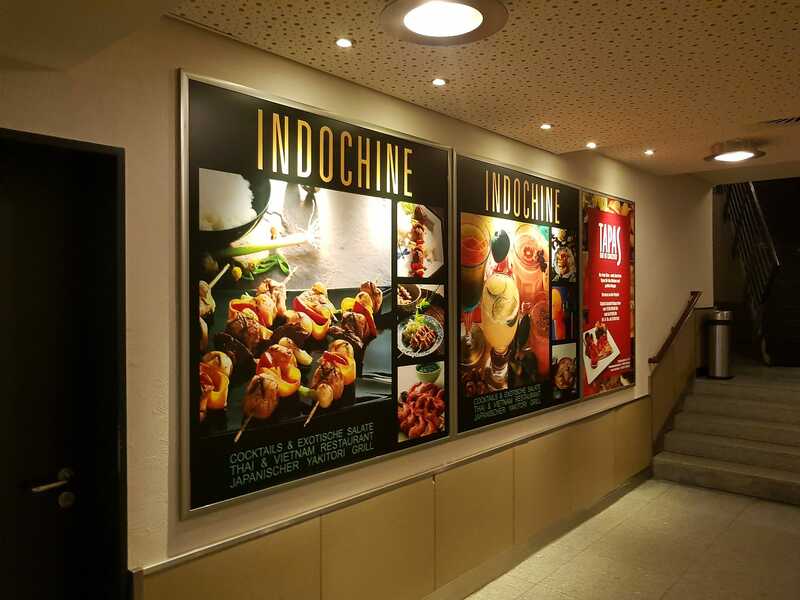 Proving that no part of the cinema is off-limits to high tech, whether projection booth or retail, you can scan a QR code that lets you order your food and beverage directly in your smartphone and then collect it at your convenience. 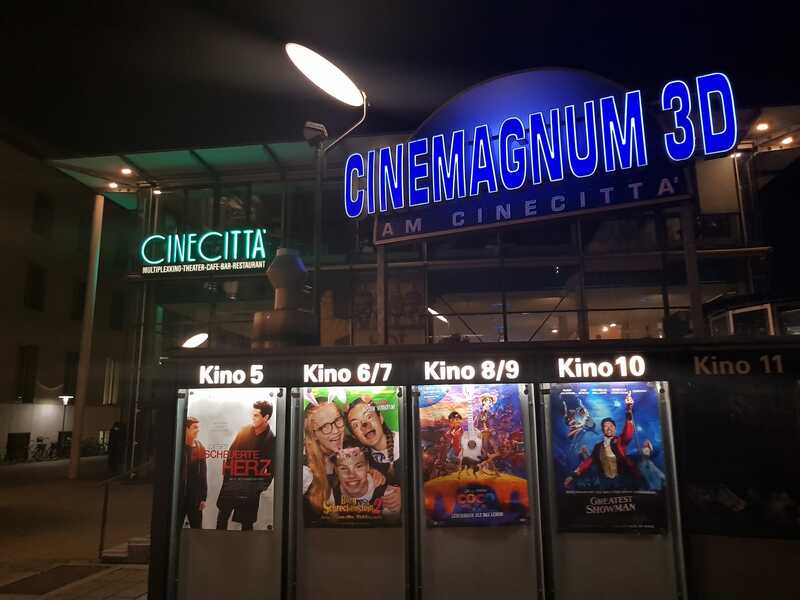 Cinecittà has had an enormous impact on cinema viewing in Nuremberg, not just in terms of raising the bar for the level of design, technology, service, comfort and more, but in terms of raw numbers. 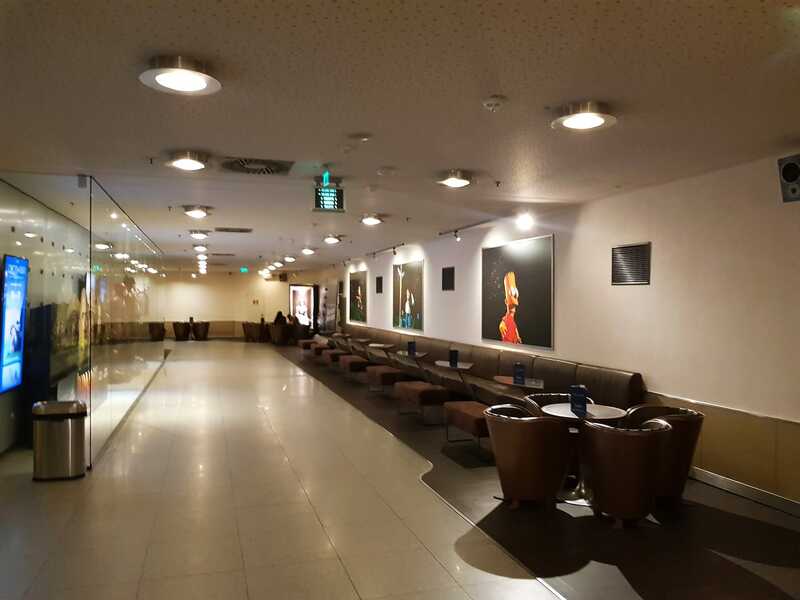 It helps that it is located in a particularly wealthy part of Germany and Bavaria, but this alone does not explain the boost it has had and why it has welcomed over 30 million patrons through its doors. According to the cinema’s Wikipedia page, in 2004 the inhabitants of Nuremberg went to the cinema on average 4.4 times per year, compared to 1.9 for the rest of Germany. This is even more than the highest average attendance of any European territory (France and Ireland are at 3.3), with only Iceland approaching an average of four visits per person, per year. 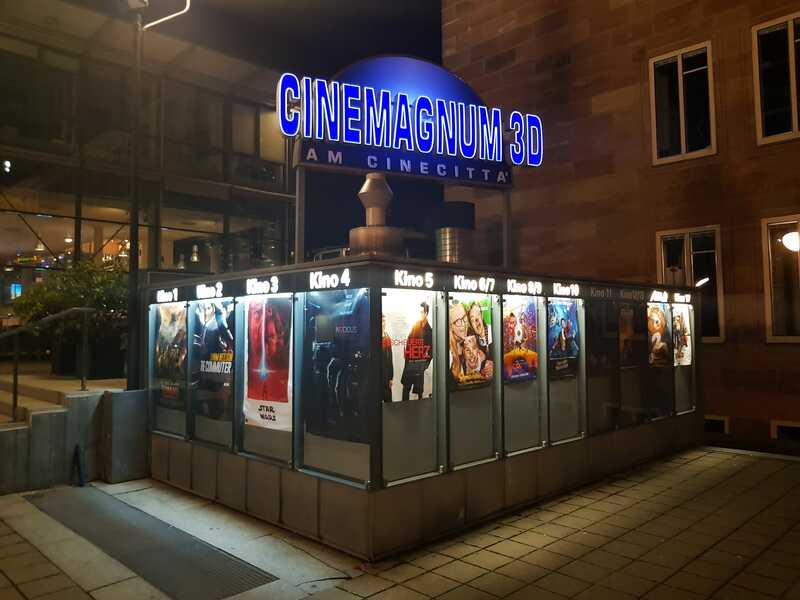 This has put significant pressure on the other cinemas in Nuremberg. 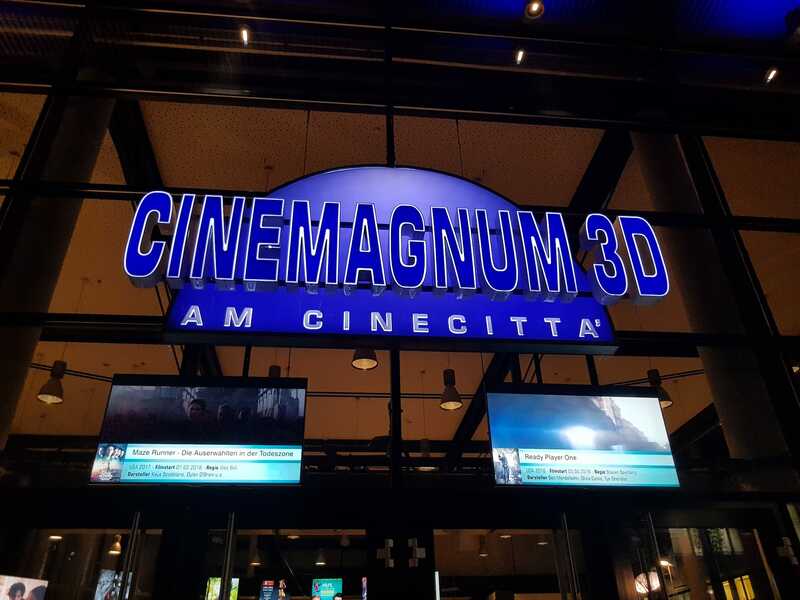 Out of 2.2 million cinema visits in Nuremberg during 2004, 1.8 million were at Cinecittà, with 270,000 of those going to what was then still the new IMAX cinema. Four years after the Cinecittà opening, the Atlantik cinema closed, and the Admiral cinema founded in 1908 had to be torn down in 2000 so the new Admiral-Filmpalast could be built in its place. 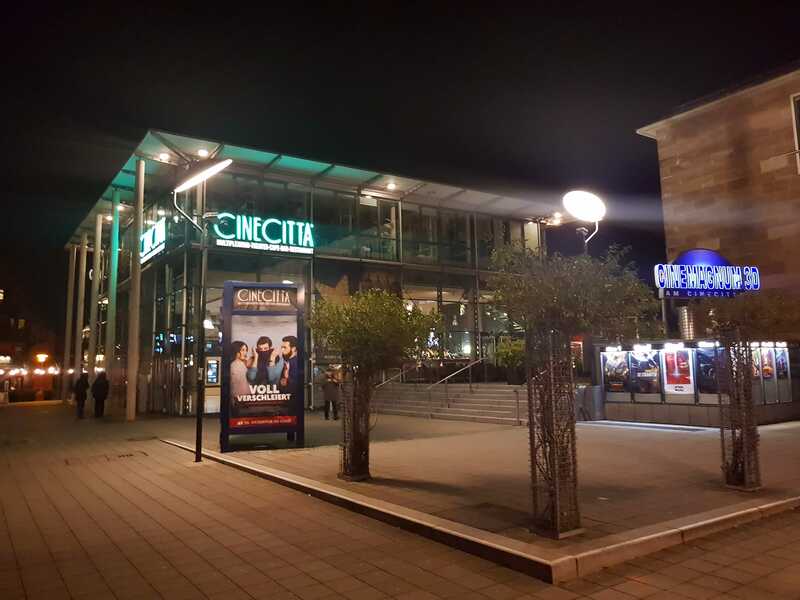 Even cinemas in nearby Erlangen were affected. 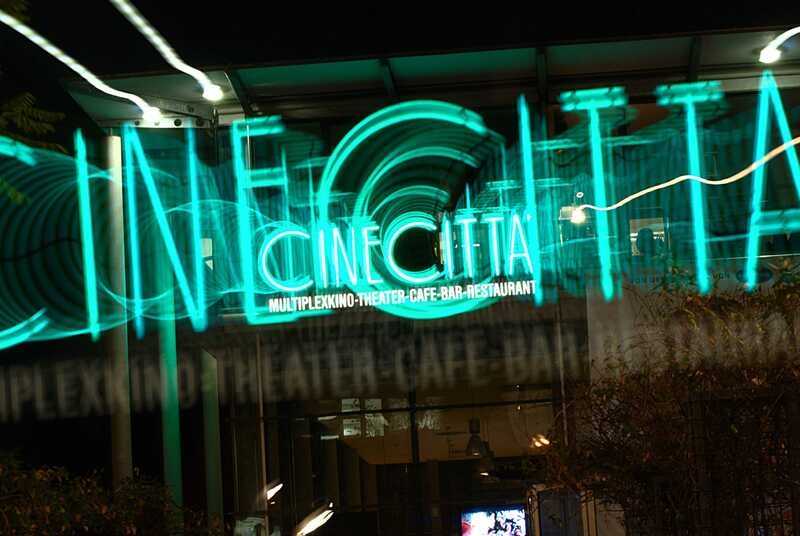 With 1.6 million visitors per year, the gravitational pull of Cinecittà continues to be strong. Since 2017 the cinema has been run by 27-year old Laura Weber, daughter of founder Wolfram Weber, who together with her sister Mara “practically grew up” in the halls of the Cinecittà. She has a bachelor’s degree in tourism and event management, and has been working in the family business since 2009, starting with a EUR €450 euro (USD $550) per month salary position in the marketing department. 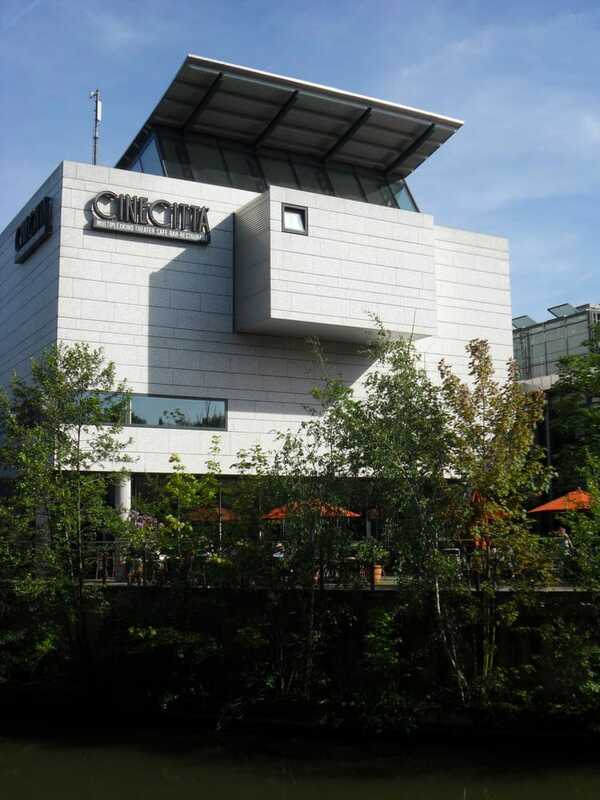 Since then Ms. Weber completed an MBA while working in practically every department of Cinecittà. Now she is responsible for the entire cinema and its staff of 450-500 people from 25 different countries. Wolfram Weber, meanwhile, describes his current role half-jokingly as “advisory caretaker.” But he is far from idle or planning to retire. 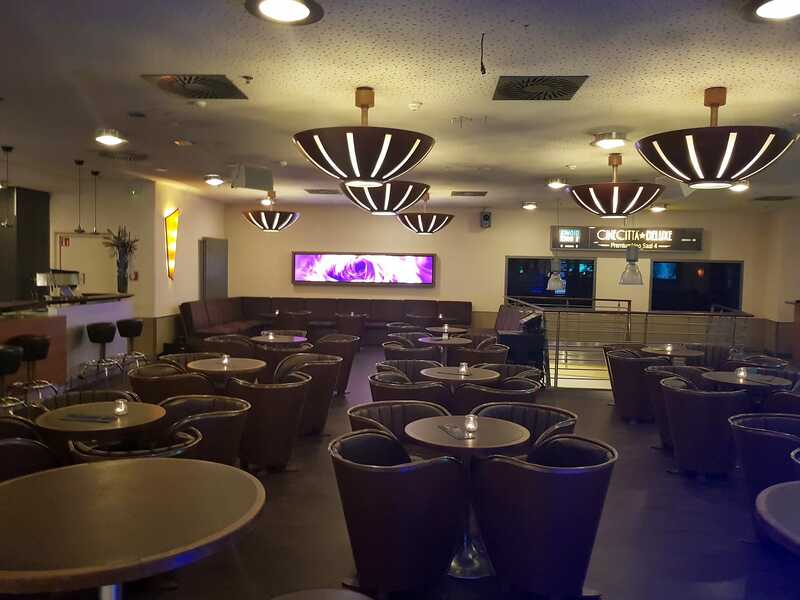 Mr. Weber recently took over the Manhattan cinema in nearby Erlangen and is in the process of turning it into a luxury mini-plex (three screens with 54, 51 and 25 seats) with all the latest high tech and comfort that signifies his flagship cinema. 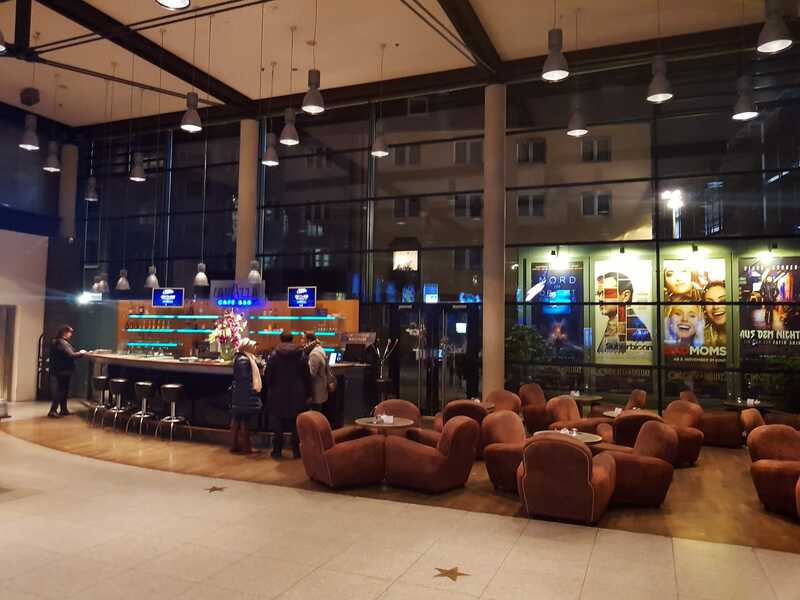 If it is anything like its bigger sibling it too will be worth a trip to Erlangen just to visit the Manhattan Deluxe Premiumkino when it opens.